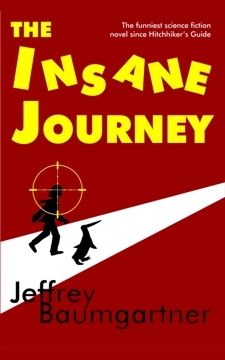 The Insane Journey is a twisted tale about mentally unbalanced men, clever women, a talking penguin and a couple of aliens all participating in a deadly chase across a desolate, wind-swept Europa that exists in a tomorrow slightly to the left of yours and mine. Maxwell is a spoiled rotten, wealthy and womanising artist – but is he an evil demon bent on defiling the souls of womankind? Evangelical preacher Father Phineas Forge and his band of ninja nuns believe so – and have decided to expedite Maxwell’s journey to hell by assassinating him. Maxwell, however, would like to postpone his journey to hell and is fleeing for his life across the desolate, wind-swept country of Europa to his ancestral home in Erps-Kwerps where he believes he will be safe. Meanwhile, he’s got a couple of imaginative tricks up his sleeve to keep his pursuers at bay. Also chasing after Maxwell are some friendly aliens resident on Earth. They believe Maxwell has torn the fabric of the Universe which could have terrible consequences for the Universe in question. Or it might not. In any event, they want to put things right and need help from Wendy, Maxwell’s best friend who happens to be an intellectual kairuku penguin, and Lucy, a leading astrophysicist and victim of Maxwell’s charms – in spite of her usual preference for women. Then there is a confused hitch-hiking angel, a bumbling team of agents from the Interplanetary Intelligence Agency, a mysteriously dangerous seductress, dimwitted human-cockroach hybrids and a handful of other curious characters all of whom seem bent on preventing Maxwell and Wendy from getting safely home. Even if Maxwell makes it to Erps-Kwerps, will he be safe there? The Insane Journey blends science fiction, magical realism and humour to create an unforgettable tale that will make you laugh and think. Buy the Epub version here and now!